OSHA Compliance is an uphill battle for many employers, but it’s a battle worth fighting. OSHA Compliance can save you thousands of dollars by avoiding costly fines or by preventing damaging Workers’ Compensation claims down the road. To tackle OSHA Compliance we always recommend regular safety training. This is one of the most effective ways we help our employers with OSHA Compliance. Employers Resource Safety Team offers our clients safety training that is done either onsite or over the internet. Regular training is a great way to keep safety on your mind and in the minds of your employees. OSHA communicates annually with employers to let them know where their safety focus will be in the coming year. As you review the annual list from OSHA, you can examine your potential problem areas and provide the proper training so all employees will be OSHA compliant. We perform onsite training all year long with our clients. It’s a great chance to visit their workplace and help them in person. However, with the vast amount of communication technology, both mobile and in the office, it is now easier than ever to provide more frequent and ongoing training via the web. Training via the web saves time and travel costs. Through the use of webinars clients can choose training meetings that work around their schedule. Clients who need to schedule their meetings at the start of their workday can do so with ease. From our office the Safety Team can set the meeting up and provide the training without incurring the cost of travel. As an example, one client in Dunkirk, NY requested monthly safety meetings to be held in the morning on the first Monday of the month. We have been able to hold these meetings, providing the leadership necessary without leaving the office. 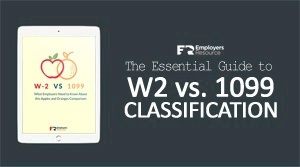 This has proven to be a “win win” for both the client and Employers Resource. Using this webinar format the Safety Team offers our clients training via short slide presentations. We also offer an optional “tool box” type means of training like our seven-minute training sessions. These are perfect for clients with field crews. They provide a quick but concise training with over 180 training topics in both English and Spanish. This method of training by Employers Resource Safety Team helps ensure our clients’ compliance with OSHA’s mandate for training workers. We are committed to assisting our clients in complying with the OSHA standards that apply to their particular business. If you’re not sure which rules apply to your company, we can get you started on the path to compliance today. Don’t get caught short in 2014! Are You Ignoring Workplace Flexibility? What Kind of Business Uses a PEO? Reduce injuries. Mitigate risk. Control costs. Visit our workers" compensation and safety services page. Like what you see? Sign up for email updates!